The Sonic Blade is totally different. The precision blades are driven by a powerful high-torque motor, which move the blades back and forth hundreds of times a minute. This generates incredible cutting power – so much so, that the Sonic Blade sonically separates whatever it is cutting — making clean, even slices in virtually any kind of food! In fact, during extensive product testing, the Sonic Blade perfectly cut everything from hard plastic “clamshell” cases, to the most delicate angel food cake! The “sonic blades” do all the cutting, so you don’t need to push down on the blade, or saw at your food. The Sonic Blade does all the work! 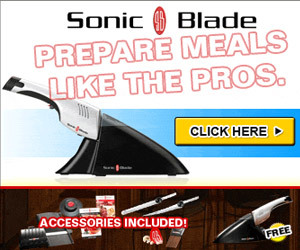 Even if you have never used an electric knife before, you‘ll love the fast and simple ease of the Sonic Blade!